Agriculture is one of Australia’s most important industries, despite the difficulties faced in our tough, uncompromising environment. Innovation and efficiency have been critical to Australian agricultural productivity and competitiveness, and Bioscience has been helping farmers and growers succeed for over 25 years. At Bioscience, our strength is understanding soil from every perspective: how it retains water and nutrients, its physically properties, and most importantly, the beneficial and harmful ways soil microorganisms interact with plants. With our practical experience and research into crop nutrition, soil stability and soil microbial ecology we have developed world leading products and technologies to help farmers improve the health of their soils that underpin sustainable and profitable plant production. Sustainable, profitable and efficient solutions. After many years of working and talking with farmers, and research into crop nutrition, soil stability and soil microbial ecology we have developed world leading products and technology to keep farmers on track to achieve healthier soils that promote sustainable, profitable plant production. 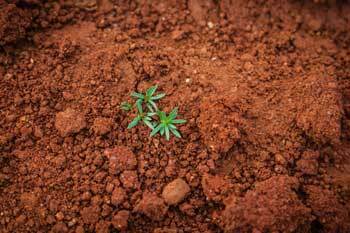 Soils contain vast numbers of microorganisms. 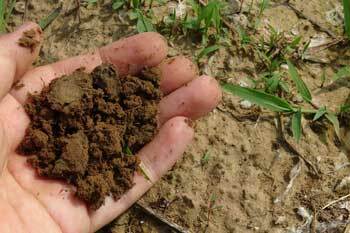 Just one gram of a healthy soil can contain over 10,000 species of bacteria and 1010 individual cells. These bacteria together with other soil microorganisms (e.g. fungi and archaea) form the “soil microbiome”. High biodiversity is indicative of a healthy soil, so when there are more microbial species in your soil, the healthier and more productive it is likely to be. Understanding how many and which microorganisms live in your soil allows us to determine effective management strategies that will increase the productivity of your soil. We can accurately measure the diversity of your soil microbiome and combine this knowledge with data from your soil fertility analysis to recommend an appropriate treatment plan to restore your soil’s health. We can also compare the soil microbiomes of different fields, plots, treatments, management practices, and amendment types. This is a particularly helpful monitoring tool if you are trying to improve your soil health and want to determine if what you have done had beneficial effects on your soil biodiversity. After you submitted your soil samples, we extract the DNA from the living organisms in your soil. We then use DNA technology to determine the number of operational taxonomic units (OTUs) which is a proxy for the number of species present in the soil. Next, we perform principle components analyses (PCA) to understand how the microbiome has changed in response to our treatment plan. Ecology aims to understand the distribution and abundance of organisms, and their functions within their community. An organism’s ecology is moderated by interactions with its environment and other organisms. Species-rich ecosystems with extensive networks of interactions are generally more stable, less susceptible to climatic stresses, and deliver improved ecosystem services. Soil microbial ecology as a scientific discipline is only beginning to understand the complex interactions between all the microorganisms living in the soil. This has been made possible by relatively recent advances in molecular biology. These allow us to study microorganisms that cannot be cultivated in the laboratory by sequencing their DNA which tells us not only “who is out there” but also “what they do”. The chart gives an idea of alpha diversity (the number of species in one sample) and this can be simplified to allow easy comparison of the diversity of soil samples that originate from different locations or different treatments within the same paddock (beta diversity). Below you can compare the microbiomes of soils collected from five different locations across Western Australia. Each of the nine groups presented constitutes a different proportion of the overall diversity. For example, the afore-mentioned Actinobacteria (orange) are more abundant in the Ravensthorpe soil than in the Badgingarra soil, while the Bacteroidetes (green) are very abundant in the Kojonup soil but only constitute a small proportion of the microbiome in the Buntine soil. To understand larger microbiome datasets, for example when investigating the relationships between the origin of soils and agricultural management practices, the chart above can be simplified further. The graph below shows the microbiomes of 150 soil samples (from our >2,000 sample database) represented as individual data points. Soil samples that cluster closely together have similar microbiomes whereas soil samples with vastly different microbiomes are depicted further apart. The chart above shows that the soil microbiomes from Kojonup (green) and Ravensthorpe (red) are fairly similar to each other despite these two locations being 300 km apart. 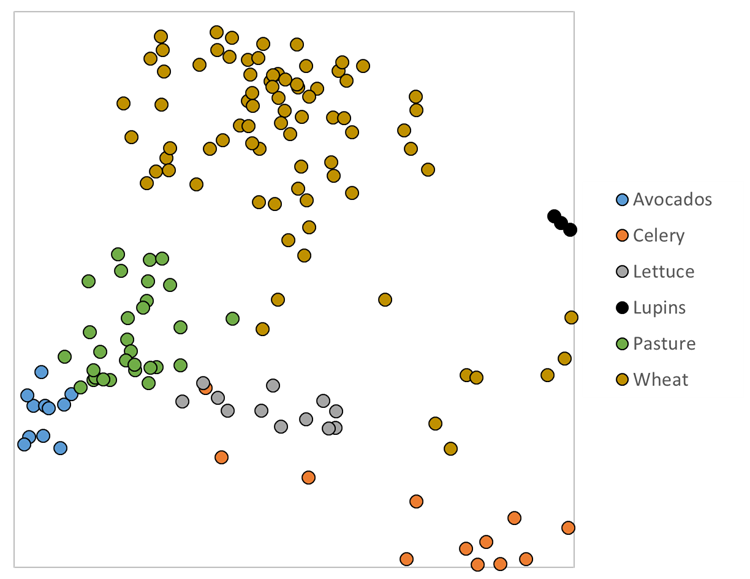 In the chart below the same microbiome data points are shown but instead of location they are coloured according to the crops grown on these soils. You will see that the Kojonup and Ravensthorpe samples were all taken from paddocks with wheat (yellow) in them so they originate from soils that are managed as part of broad-acre agriculture meaning they received similar fertiliser inputs and crop rotations in the past which have left their mark on the soil microbiomes. 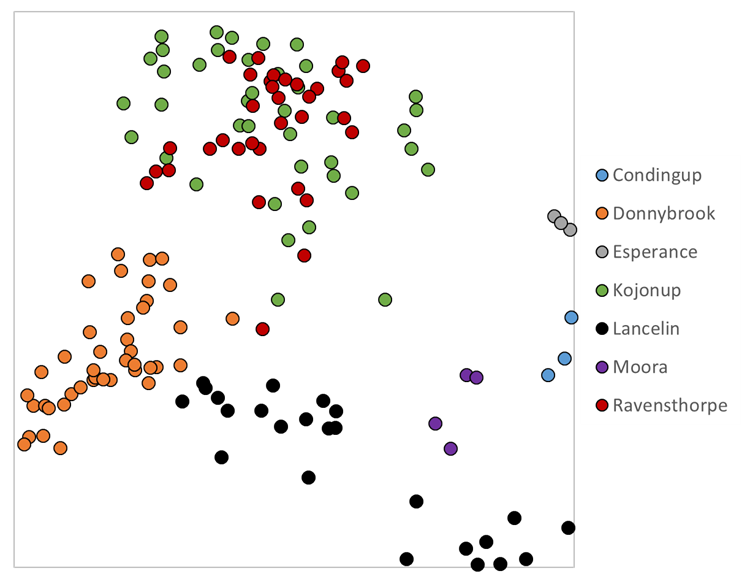 You will also see that the Donnybrook samples (orange in the chart above) are now presented in two distinct clusters (blue and green). The microbiome samples coloured green originated from pasture soils while the blue coloured samples came from an avocado orchard. So despite the Donnybrook soil microbiomes being relatively similar, they are distinguished by the crop grown on them. The above data serve as an example as to how we can measure soil microbiomes and determine treatments effects. 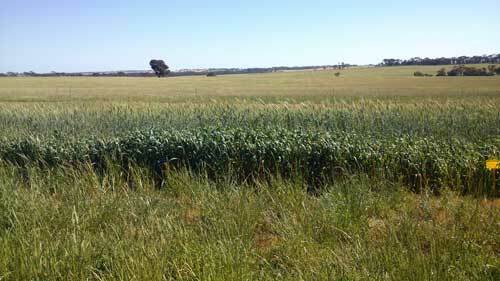 This forms part of our ongoing R&D projects with clients seeking to increase their soil health. 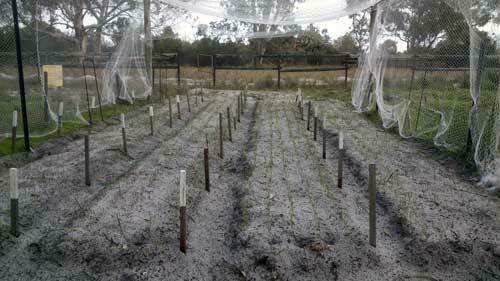 Plants recruit specific bacteria and fungi from the highly diverse soil microbiome to live in and around their roots. The soil surrounding the roots is called the rhizosphere and is a hotspot of microbial activity. Microorganisms that live in the rhizosphere are functionally important to their plants as they can deliver nutrients and even protect plants from pathogens. In turn, plants provide carbon as a food source to maintain the symbiotic relationships with their rhizosphere microbiome. The rhizosphere is a complex environment where microorganisms communicate with each other and with their plant hosts. This communication is done via signalling molecules that are being excreted by both microorganisms and plants to establish their symbioses. These communication networks in the rhizosphere hold great potential for the improvement of crop production by better agricultural management practices. Bioprime is our approach to take advantage of microbial signalling networks to produce healthier plants and achieve higher crop yields. Bioprime is a unique soil priming agent that works by changing the soil microbiome. When applied to soil, even in very small amounts, Bioprime changes the diversity within a wide range of important soil microbial groups, promoting the development and diversity of beneficial microbes. The outcome of these changes is a stronger plant, better root growth, and ultimately a more efficient system delivering higher crop yields. Bioprime is manufactured from natural raw materials using a patented process. Bioprime is non-toxic and completely biodegradable. Most importantly for grain growers, only small volumes are required (2-4 L per hectare) to produce beneficial changes, so it is an inexpensive way to look after your soil’s health. Bioprime contains a wide range of organic components. Some components, “quorum quenchers”, act to suppress harmful pathogens while others act as soil priming agents and “quorum sensors”, stimulating microbial groups known to be beneficial to plant roots. Some components are identical to the organic acids and signalling molecules that plant roots secrete to attract beneficial microbes. 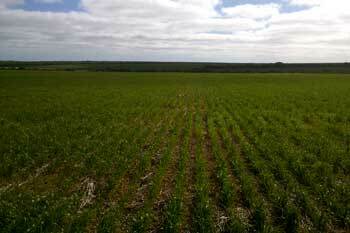 Improved overall soil health for a more productive system resulting in increased crop yields. Bioprime produces a healthier soil with greater diversity of beneficial microbes and a reduction in pathogens. Most importantly for grain growers, only small volumes are required (2-4L per hectare) to produce changes, so it is inexpensive. 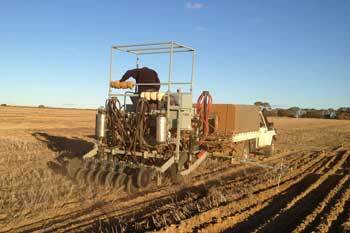 Bioprime has a 20-year history of use in intensive horticulture mainly for disease suppression. Since its inception, Bioprime has been rigorously tested in a variety of pot and field trials, and in different farming systems including horticulture, broad-acre agriculture, and the nurseries industry. It has proven successful in suppressing diseases and promoting plant growth and yields. Thus, Bioprime has increased the profitability of our customers’ businesses. Recent advances in fermentation technology have led to increased levels of active ingredients and lowered production costs making it very cost-effective for our customers. We are committed to ongoing R&D of Bioprime and open to work with our customers in determining optimal application times and rates for their specific crops and production systems. 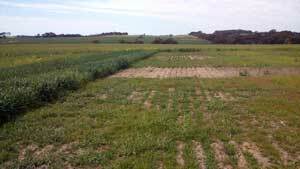 Bioprime field trials have been conducted for a number of years at different locations. 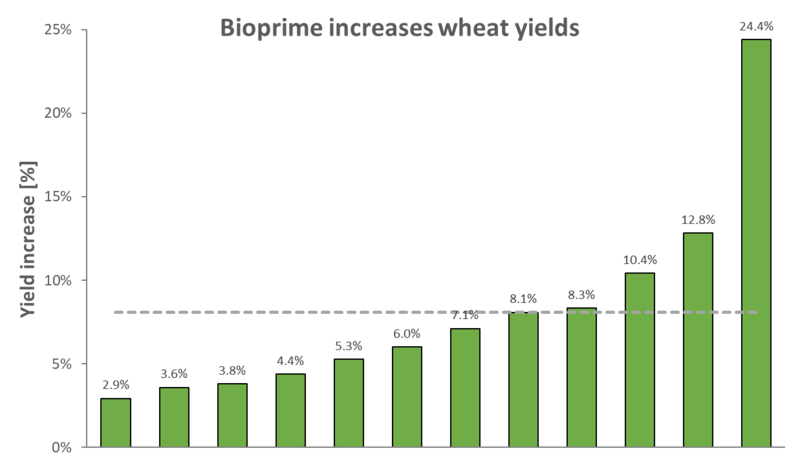 The graph below shows increases in wheat yields after applying Bioprime at different locations across Western Australia. The average grain yield increase of all sites and years is 8.1% (represented by the grey dotted line). The variance in the data can be explained by the differences in soil fertility before the trial meaning that we see bigger improvements with Bioprime on less fertile soils. Bioscience works hand-in-hand with Australian farmers and producers to develop our specialist products and services. 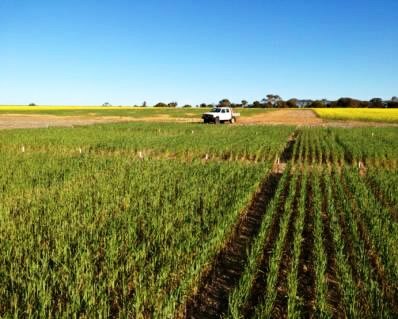 Our Australia-wide trials help to further our research and knowledge and ensure the Australian agricultural industry remains a world leader. Contact us for more information or to participate in our next R&D trials.